Youth Unemployment and Recession | This is Ashok. On the other hand I agree with Tyler’s more recent post claiming the US labor market has structural problems. Unlike Tyler, I think more AD could help fix those structural problems (by pushing Congress to lower maximum UI from 73 weeks to 26 weeks). Tyler’s right that the big problem is among the young. The fact that we are thinking of again boosting the minimum wage boggles the mind. The recent rise in youth unemployment can NOT be fully explained by the recession. I’ve argued that increases in the minimum wage have a particularly devastating effect on youth and minority workers. I don’t think any wage controls should be implemented without well-thought exceptions for our youth, like the United Kingdom. Indeed, I would prefer that certain minority-concentrated areas also get exemptions from a wage control, but that would just be racist. 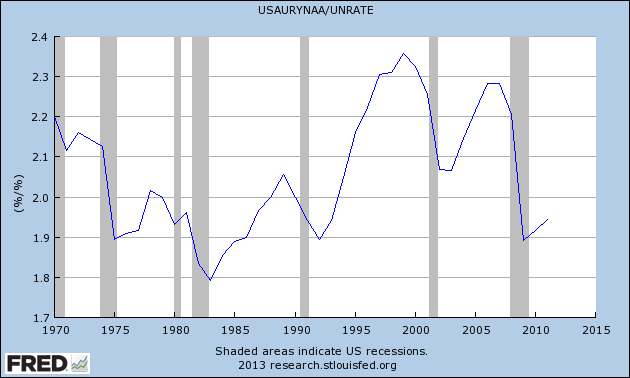 However, I really don’t understand Sumner’s claim that recent youth unemployment can’t be explained by the recession. Now, immediately looking at this graph, one might say Sumner is right: the minimum wage law that was passed in 2007 takes full effect in 2009, precisely the time youth unemployment rises relative to real unemployment. However, I’m very unconvinced that the wage increase has anything to do with this dynamic. For example, in 1997 the minimum wage was raised to $5.15/hr, and we see a sharp relative decline in youth unemployment through 2004. Indeed, even after 2007 and 2008 when the minimum wage was set at in interim $5.85/hr and $6.55/hr the relative youth unemployment falls. This is not to say the minimum wage has no effect on the youth, but that there’s no conclusive evidence that the current state of youth unemployment – which is always higher than civilian unemployment – is something uniquely structural, beyond the recession. There is a signaling problem: the New York Times recently reported that it’s impossible to find even a menial job without a degree. This is particularly exacerbated by the recession where underemployment of the skilled crowds-out the truly unskilled. We both agree that there’s a strong case against an unqualified minimum wage and tight money. We don’t agree that there’s some special and odd “recent rise in youth unemployment”.